Portland State’s 49-acre downtown campus is located in the heart of one of America’s most vibrant centers of culture, business, and technology. We are recognized throughout the world for programs like Urban Planning, Social Work, and Environmental Studies that directly engage the community, and aim our students towards the creation of a better, more sustainable world. Comprising eight schools and colleges, Portland State is the largest public university in Oregon and is one of the 100 largest public universities in the nation, enrolling more than 28,000 students. Located centrally on campus on Portland’s Park Blocks, a greenspace and urban city park, the University Library welcomes more than 1 million visitors each year and provides essential resources to students, faculty, staff, and the general public. 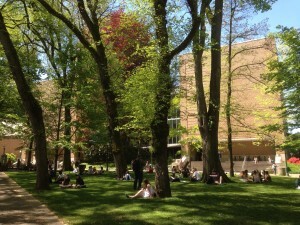 The University Library is an active and influential member of the Orbis Cascade Alliance, a consortium of 37 academic libraries in Oregon, Washington, and Idaho. The Science and Social Sciences Librarian consults and collaborates with scholars; participates in a dynamic instructional program, including classroom and online instruction; provides reference and information services for the University’s students and faculty as well as members of the community; and selects information resources to support the instructional and research needs of a diverse institution. This position will serve as a liaison to academic units and area studies such as Anthropology, Environmental Sciences & Management, Institute for Sustainable Solutions, Geography, and Geology depending on the needs of the Library. Some evening and weekend reference duty and/or instruction is required. Portland State University faculty members contribute to faculty governance activities within the Library and the University, engage in community and professional service, and pursue an active scholarly agenda including publication, research, and seeking grants as appropriate. This full-time, 12-month, tenure-track faculty position reports to the Assistant University Librarian for Public Services. The annual salary rate for this position is $68,856 with an excellent benefits package including 95% premium paid healthcare; a generous retirement and vacation package; and reduced tuition rates for employee, spouse, or dependent at any of the Oregon Public Universities. Portland State University is an Affirmative Action, Equal Opportunity institution and welcomes applications from diverse candidates and candidates who support diversity.